Mahound's Paradise: Quebec City Mosque Attackers Shouted "Allahu Akbar" - One Suspect is of "Arab Origin"
Quebec City Mosque Attackers Shouted "Allahu Akbar" - One Suspect is of "Arab Origin"
This evening, two or three masked men burst into the mosque of the Islamic Cultural Center in Quebec City, firing automatic weapons. At least six people were killed and eight injured. Two gunmen were quickly captured. The authorities have still not released their names. Radio Canada earlier reported that a witness inside the Mosque had heard one of the gunmen shout "Allahu Akbar" with a Quebecois accent. Now, TVA nouvelles is reporting that one of the suspects is of "Arab origin" and the other is of "Quebec origin." The latter term is often used loosely. UPDATE (2:20 PM CST): Montreal-based LaPresse is reporting that one of the suspects is of "Moroccan" origin. 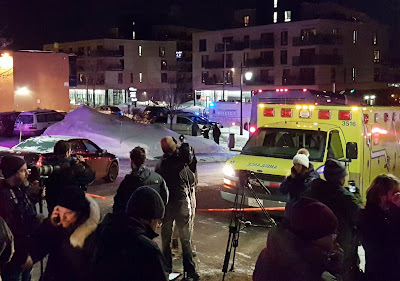 UPDATE (3:20 PM CST): Now it's being reported that the two gunmen are students at Laval University - a school has a large Muslim population and numerous terror ties. One of the suspects in custody is "Moroccan-Canadian." An unconfirmed report claims the other is from Guinea. At this point it it very likely that both are Muslims. There is speculation that the two men were from a rival breakaway mosque but this has not been confirmed. When news of the attack broke, social media erupted with tweets and posts blaming Donald Trump, who it was alleged had prompted the attack with his recent "anti-Muslim" travel ban. There were also more general condemnations of "hatred", "intolerance," and "Islamophobia." The Daily Beast even published the names of two "white supremacists" who had allegedly carried out the attack before being forced to retract the story after it turned out they had been hoaxed by a fairly obvious "fake news" satire piece (the "white supremacists" were second-tier right-wing media personalities). As it began to look more and more probable that the terrorist attack was not the work of Islamophobic Trump supporters but was instead part of an internecine Muslim conflict, some of the accusations that "Trump was responsible" gave way to pleas "not to jump to conclusions." And many began to argue that "it didn't matter who the attackers were." Rather, what mattered was that "the victims were Muslim." Muslims killing other Muslims, sounds good. My first hunch was that it was internecine conflict. As I read a few accounts, the pig's head occurrence attempted to buttress speculation that non-Muslim haters were suspect. Yes, what's all this "Arab origin" blabber? One day before the attack, the epicene leader of Canda took to Twitter professing his love for Diversity and Immigration. As did the rest of the civilized world. You're childish use of epicene tells us all we need to know about you. Did you completely miss Trump's campaign for president?? All he did was use identity politics to get elected. You people are insane...as well as being the vast minority. This is why I read your blog Oakes. I am not catholic and am more of a libertarian than you seem but this response is typical of you. Someone insults you and your readers and you respond politely and even leave one of the three hate pieces they left up. I don't necessarily agree with you often but you are a decent man.